If you were to ask me to suggest a pair that will please most people—no matter their musical tastes or how they intend to use them—I’d recommend Jaybird’s X4 wireless sports earphones. Waterproof, lightweight, comfortable to wear, and boasting an adjustable equalizer, the X4 has enough going for them that almost everyone will enjoy owning them. Weighing just over half an ounce, the X4 is so light that you can forget you're carrying them in your pocket. When they're stuffed in your ears, their minimal heft helps deliver a listening experience that most people will find comfortable for hours. The tail end of the X4’s comfort comes courtesy of the Jaybird’s inclusion of three different sizes of silicone ear caps and three different sizes of silicone ear fins to help keep the X4 in your ears where they belong. Jaybird uses a soft silicone for these ear caps and fins, and wearing them provides a similar experience to what one can expect from a pair of Bose’s legendarily comfy earbuds. Once I found the right combination of ear fins and caps, the earphones fit incredibly well: No amount of head banging, jogging, or household chores could persuade them out of my ears. For those looking to use the X4 at the gym or while out on a bike ride, you’ll find that Jaybird’s silicone caps allow enough environmental noise to reach your ears for an acceptable amount of situational awareness. If your plans for the X4 don’t include working out, Jaybird’s still got your back: The earbuds also ship with two pairs of Comply’s crazy comfortable foam ear tips. 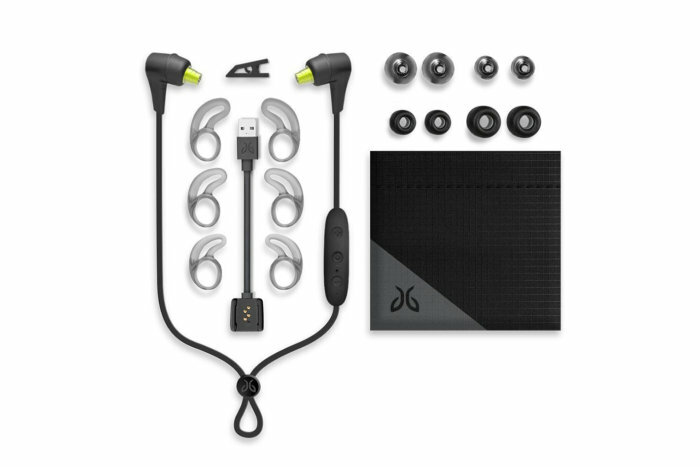 The Jaybird X4's sleek, waterproof design makes them a welcome addition to anyone's everyday carry. Comply’s tips are highly regarded for the amount of passive noise cancellation they can add to a pair of earphones. While wearing the X4 with Comply ear tips, I found I was unable to hear the majority of what was going on in the world around me—an introvert’s dream. As an added bonus, the superior in-ear seal afforded by foam tips over those made from silicone allows for richer low-frequency sound. That means the music you love will enjoy a free bass boost when you're rocking the Comply tips. 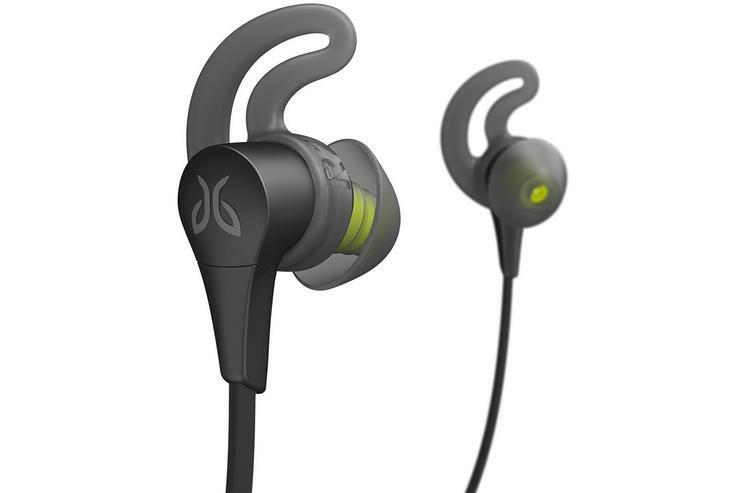 In the past, Jaybird’s X-series earphones came decked out in a glassy black and florescent yellow-green color scheme. This option’s still available to X4 users, but it’s also possible to score a set of these earbuds in blue and grey or metallic green. No matter which you opt for, they look sharp: Their matte finish, subdued branding, and flat connective cabling gives them a premium appearance you’ll be proud to sport. Like most of the earbuds reviewed here, the X4 feature an in-line module containing the earphones’ battery, microphones, and controls. Jaybird’s three-button control scheme is simple enough to use. The X4’s volume buttons do double duty, allowing users to skip ahead or back a track as they listen to music. The middle button powers the earphones on and off or allows listeners to play or pause their music. A single, sustained click on this central button also lets you create new Bluetooth connections. As the X4 earphones support Bluetooth 4.0, they can pair with two devices simultaneously, such as an iPhone and a MacBook Air. I found the X4’s connectivity to be flawless with my audio source sitting next to me while I listened to music, and it remained acceptable up to 10 or 11 feet away. 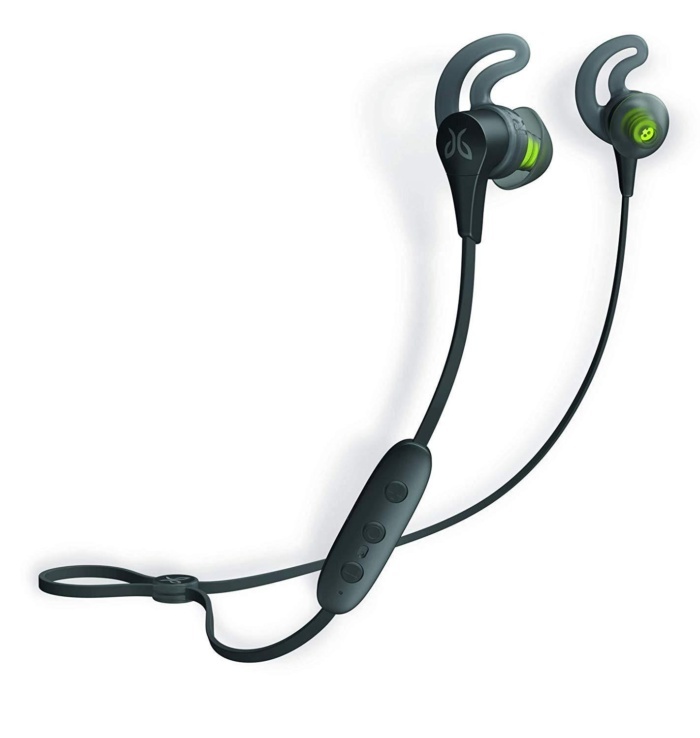 The X4 come with an IPX7 rating, which means they can be fully submerged in up to one meter of water for at least 30 minutes, so it’s safe to take these earphones out in the rain or sweat all over them at the gym. When you come home, give them a quick rinse in the sink: They’re designed to take it. The only downside to providing this level of waterproofing is the designers had to remove the charging port. As such, you'll need to charge the X4 earphones with a proprietary USB charging clip that mates with the buds’ in-line controls. If you lose your charging clip, Jaybird sells replacements for around $5. Unfortunately, as you can’t just run out and buy one as you can with a USB-C or Micro-USB cable, you’ll be forced to go without music until your new clip shows up in the post. While we’re on the topic of charging, Jaybird claims the X4 should provide eight hours of runtime. I found this number to be accurate and, on a number of occasions, I was able to get nine or 10 hours of use out of them between charges. If you need to fill your head with music in a hurry, connecting the earbuds to their charging clip for 10 minutes will score you around 60 minutes of runtime. I’ve always been impressed with the sound of Jaybird’s in-ear audio devices, and the X4 headset is no exception. You’ll be hard-pressed to find a pair of Bluetooth earphones that perform better for this price. While wearing either the included silicone ear tips or Comply foam tips, I found that the X4 provided ample amounts of punchy-sounding bass, forward-sounding vocals (so your favorite singers aren't drowned out by the band behind them), and crisp high- and mid-frequency sound—most of the time, anyway. When used at their maximum volume, which you shouldn’t really do, the sound separation—which lets you hear each instrument being played as opposed to making a band sound like a big, melodic traffic jam—starts to sound a little muddy. If you’re not thrilled with the sound of these earphones, Jaybird’s free MySound iOS app lets you tweak the equalizer to suit your tastes. Once you’ve created a sound profile you like, you can save it and share it with Jaybird’s other users while continuing to experiment with new EQ settings. Not into tweaking? Jaybird also preloads the MySound app with a number of EQ settings to get you started. For those who prefer to use Comply’s foam ear tips but dislike the additional bass they bring, the app provides an easy way to take down the thump a few notches. Most importantly, the changes you make to the X4’s EQ on one device carry over to other audio sources as well. I was pleasantly surprised to discover that the tweaks I made while listening to music on my iPhone were still in place when I used the X4 with my Fiio M7. Audio calls were the one area where the X4 didn’t perform as well as I would have liked. In order for someone on the other line to understand me, I had to place the X4’s in-line control pod directly next to my mouth while talking. That’s not what I’d call a hands-free experience. Additionally, while the microphonics produced by the X4's cables were minimal while listening to music, the people I spoke with while using the earphones with my iPhone 7 Plus reported that they could hear the thump and rustling of the cables as I walked and talked. Offering a comfortable fit, outstanding waterproofing. and pleasing, adaptable audio at a reasonable price, the Jaybird X4 wireless sports earphones are a great choice for anyone looking for a new pair of Bluetooth earbuds.